A letter from our August edition. I started writing this letter to highlight the barriers that aspiring psychologists face in gaining qualifications and development. In doing so, I’ve been forced to reflect on how that journey has shaped me as an individual and a professional. After graduating in 2012, I thought ‘I can never afford to do a master’s’. Despite having always aspired to apply for a forensic MSc, I figured if it wasn’t essential to the assistant psychologist criteria, why return to juggling essays and waitressing? What I found was that most other candidates in AP interviews had the magical MSc. Psychologists that I met through my HCA-level jobs advised me that obtaining psychologist posts without one was impossible, never mind applying to the Clinical Doctorate. Alongside this, I was quickly outgrowing my Band 3 positions and became frustrated with not being able to access more development. I felt resentful towards others that seemed to have doors opened so easily because their family had more money than mine. After five years, I surrendered. I finally ignored my budget and was delighted when King’ College London offered me an MSc place. Unfortunately, the hard numbers were still difficult to swallow: £9000 for fees alongside my (conservative) estimate of £11,000 for living the year in central London. It fast became clear that doing this independently was impossible. Even if I am successful in applying for the new postgraduate government loan scheme, and then am allowed the maximum of £10,000, that still just covers tuition! Advisers told me not to worry and that there were enough scholarships to make up the shortfall. For that course, for a UK student, I found two. I particularly liked how bank loans are also listed on the scholarship page. Isn’t that an oxymoron? Nevertheless, I diligently applied with my redrafted and revised personalised begging letters, but no cigar. So I looked further afield and applied to the charities that I was eligible for. Again, considering the materials available, it sounded like there were thousands. My shortlist came to 16. For the majority I was not eligible because I hadn’t been on benefits, or don’t have dependent children, or my family do not practise a specific religion or trade. I drew the line at applying to a charity that reserves the right to conduct surprise home visits at any point during your course. Seriously? I remain hopeful, however, and am reluctantly plodding towards the conclusion that I will need to rely on a Professional and Career Development Loan. 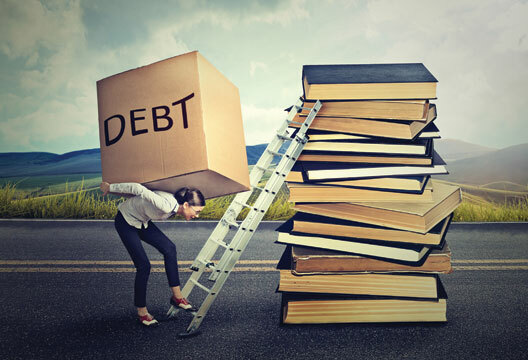 Whilst I may have hopefully improved my knowledge and chances of employment, I will have definitely pushed my total debt up to around £30,000. These prospects are the main reason that most of my fellow graduates have abandoned this career path altogether. Many say they are unable or unwilling to gamble with other hopes they have for their future, potentially compromising their ability to buy a house or have a family. However, in writing this article I have found that I am conflicted. I’m frustrated that my socio-economic status continues to delay my career progression and maybe will eventually stop it altogether. On the other hand, experiences I have been forced to go out and get after graduation have been invaluable. The limitations of being a Band 3 meant I changed jobs annually. Consequently, I’ve worked in varied and unique places. My first job was at a high-secure forensic hospital, and my most recent post is at Drayton Park. The house operates as mental health crisis house for women with an all-women team, and also admits women’s children in order to keep families together. The ethos there is based on trauma-informed practice, drawing from alternative and systemic approaches, which challenged me to develop my identity as an individual practitioner. Do I regret the experience I have gained from my low-paid positions? No. Am I angered that to continue developing I will have to take on significant debt? Yes, furious. But I am starting my MSc a more skilled, mindful and versatile individual than the person I was when I graduated. I’m sure it will be a struggle, and it seems wrong to me that there are is so little support available for the many people who work full-time but don’t have easy access to £20,000. However, the pride I have for really earning my degree and the enrichment I have absorbed from nursing and working with a variety of extraordinary people is priceless. An actor’s life for me?